Governments and companies should limit the snooping they do on web users. 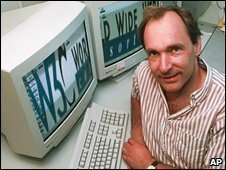 So said Sir Tim Berners-Lee, inventor of the world wide web, who said that growing oversight of browsing could have a pernicious effect. A greater part of the value of the web lay in the lack of constraints on what people could do with it. He also warned that attempts to censor what people could say or what they could do online were ultimately doomed to failure. "When you use the internet it is important that the medium should not be set up with constraints," he said. The internet, said Sir Tim, should be like a blank piece of paper. Just as governments and companies cannot police what people write or draw on that sheet of paper so they should not be restricted from putting the web to their own uses. While governments do need some powers to police unacceptable uses of the web; limits should be placed on these powers, he said. If people know that where they go online and the terms they look for are under scrutiny it could have all kinds of pernicious effects, he warned. Repressive regimes, such as China and Iran, that work hard to limit what people can do online would struggle to maintain that control over time, he said. "The trend over the years is that the internet in the end goes around censorship and openness eventually triumphs," he said. "But it is by no means an easy road." Sir Tim made his comments during a speech at an event that helped to launch the BBC Two series Digital Revolution. The four-part series aims to explore the history of the World Wide Web and generate debate about how it is changing the way people live their lives. It aims to debate how the web is changing the nation state, how it affects identity, freedom and anonymity. Over the next eight months as the programme is being produced, viewers will be encouraged to get involved by sending in questions for interview subjects and being able to produce their own clips using the rushes generated during filming. Social media researcher and broadcaster Aleks Krotoski will present the series of programmes.